This past weekend left racing fans seeing stripes alongside stars as Keeneland, along with title sponsor Marathon, celebrated Military Day at the Races on an extremely windy Sunday. 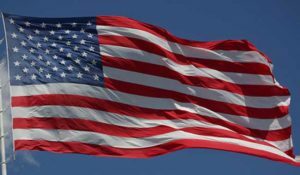 An enormous American flag was rolled out and presented on the track following race three while Keeneland’s tireless, crowd-favorite bugler, Steve Buttleman, played the national anthem and America the Beautiful. With wind gusts that reached well over 35 mph, many were worried the gigantic flag would turn into a star-spangled parachute or be torn from the grasps of those holding it to sail across the racecourse, but Henry Clay High School’s Junior ROTC held firm and left the track to cheers from the crowd, having done America proud. Active duty, reserve, military families, and veterans were granted free entry to Keeneland and were also provided reserved grandstand seating. Military personnel were also given discounts at the Keeneland gift shop and received thank you cards written at the Paddock by Keeneland attendees. In addition, Keeneland set up a Military Family Zone in the North Terrace at the track and offered military families free food and live music. Presenting sponsor Marathon then provided three military families who made extreme sacrifices for the sake of our country with $500 gas cards. Overall, the day was a fitting, emotional tribute to those who deserve it most. Next time some guy on the rail goes, “Hey look, it’s Bill Murray,” maybe we won’t be so quick to dismiss it as his having too much bourbon. Because sure enough, who should come sauntering from the Paddock on Saturday but the star himself: Bill Murray, in the flesh, to present the award to the winners of the 7th race. He’s as much a character in person as he is on screen, and a big fan of horse racing. He was quick with a joke with the folks in the press box, hung out in the announcer’s booth, and bet nearly every race jockey John Velasquez rode in on Friday. Everyone had heard the rumor that he was at Keeneland, but to see him chatting with folks in the winner’s circle Saturday was still a bit surreal, to say the least. It didn’t take long for the crowd to realize he was there, however, and soon there were uproarious cheers and shouts of “Bill!” rising above the grandstands. Murray wasn’t the only star spotted at Keeneland, though. Movie star and former California Horse Racing Board member Bo Derek showed up to enjoy a day of racing as well. These guests were just more proof of the fact every Kentuckian already knows: what a special, world-class place Keeneland is. What a weekend to be at the best place in Lexington! 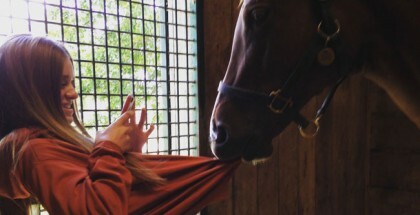 But of course, who can forget the stars that the stars came to see: the horses? Saturday was yet another packed day at the racetrack with nearly 35,000 people in attendance, approaching the record set on Blue Grass Day. 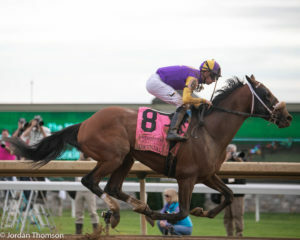 It was a crucial day for horses seeking to run in the Kentucky Derby (GI), with the Stonestreet Lexington Stakes (GIII) at Keeneland and the Arkansas Derby (GI) at Oaklawn being run within mere hours of each other, promising the top finishers the final points left on the Derby trail. Keeneland fans didn’t have to wait until the Lexington for excitement: the stakes races kicked off with the Ben Ali Stakes (GIII) and a very strong 4 ½-length win from ythe New Year’s Day colt Bourbon Resolution in an unbelievable upset. The Ben Ali was followed by the Giant’s Causeway Stakes, which was won by a fiery-tempered filly, the aptly named Morticia. Despite a wild trip in the paddock that ended with Morticia’s having to be led out by a track pony, she took the race with ease. We’re told that this ferocious filly can be tamed, however, (albeit briefly) with an odd trick — she loves sweet potatoes. It was then time for the ever-anticipated Stonestreet Lexington Stakes and when the dust settled no one could believe how that anticipation was rewarded. In a sweeping move around the far turn, the Into Mischief colt Owendale took the lead from Derby contenders Anothertwistafate and Sueno. The Brad Cox trainee went from third to last to take the lead after swinging wide past the top of the stretch and earned 20 points on the Road to the Kentucky Derby for his win. Though Owendale did not have enough points to make it to the Derby, the Derby fates for the second and third place finishers hang in the balance. Anothertwistafate and Sueno’s runs leave them in 23rd and 24th on the Derby points leaderboard and since only 20 can compete in the Derby, it begs the question: will they run, or were their Derby hopes dashed by a near miss? 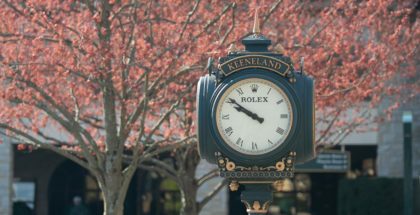 Racing at Keeneland resumes on Wednesday with a 1:05 p.m. ET post time. And remember, as is tradition, there will be no racing on Easter Sunday.